NOT just for experienced warblers, our Summer Sizzler Singing Weekend (6th-8th July) offers wannabe singers the chance to exercise their vocal cords in the company of friendly and like-minded folk. The weekend culminates in a 'cabaret' on the Saturday evening where everyone has a chance to 'shine bright (sic) like a diamond'!! "I got rhythm, I got music...Who could ask for anything more?" Who indeed, could ask for anything more?! Stunning scenery, homecooked food and plenty of time to relax and enjoy yourself by the sea. * Nick began his singing career as a boy soprano performing in Covent Garden. He later worked as an accompanist on piano and sang in a variety of choral societies and chamber choirs. For the past 20 years he has run community choirs and hosted large singing events in Bristol and the South West. 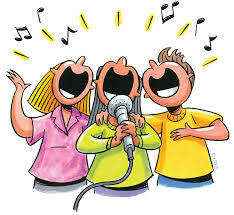 ** Jon has been singing, directing, coaching and performing in Harmony groups for over 30 years. Though he teaches many styles of music his speciality is Barbershop Harmony. He has been in several successful Barbershop quartets winning a total of 9 National medals including 4 Bronze, 3 Silver and 2 Gold. His workshops take him all over Europe including UK, Ireland, Holland, Italy, Prague and Spain. Together they make up one half of the A Capella quartet The B Naturals.